What Plants Live in the Oceanic Zone? The tropical oceans on earth lie in an equatorial band between the Tropic of Capricorn and Tropic of Cancer. Tropical water oceans comprise of the center of the Atlantic and Pacific oceans and nearly all of the Indian Ocean. The tropical oceans regulate the earth’s climate to a great degree and also play an important role in affecting large scale weather patterns. The water temperature in the tropical ocean remains at a constant 68 degrees throughout the year. The majority of plants in tropical oceans are part of a diverse ecosystem, which is well adapted to warm waters. Red algae are a plant of warm tropical oceans and have existed in their natural habitat for the past 500 million years. Red algae are rich in proteins and vitamins and are an important food source in Asia. Red algae get its red color from the pigment phycoertythrin, which has the ability to absorb blue light and reflect red light. Blue light is able to penetrate the water deeper and this enables the pigment causing the red color to photosynthesize and exist at deeper depths as compared to other algae. Red algae are relatively simple to cultivate and this process has been in place in Japan for the past 300 years. The seagrass plant group consists of nearly 60 different marine plants that reproduce through flowering and fruit production. 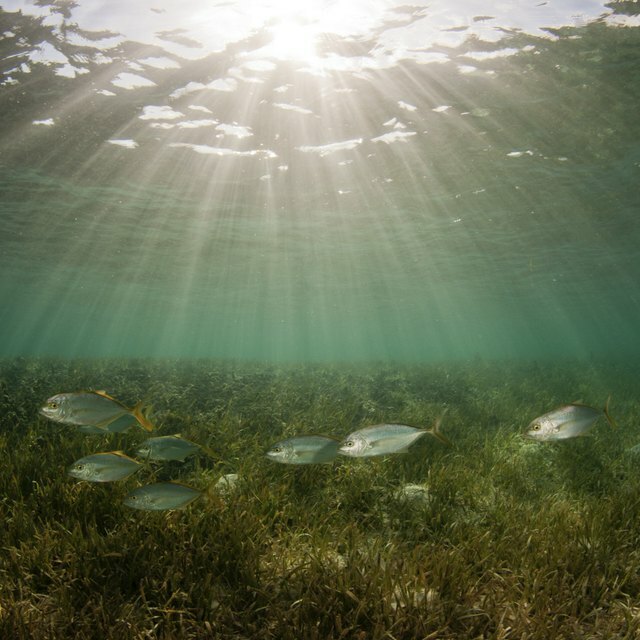 Seagrasses are abundant in the warm, tropical sea waters and, according to the 2003 United Nations Environmental Programme, they cover nearly 110,000 square miles of tropical oceans space. Seagrass beds are important fish and turtle breeding ground and provide shelter to countless fish species. Seagrass also shield coastlines from erosion and extreme weather conditions, stabilize and trap coastal sediment, and absorb carbon dioxide from the water. Phytoplankton are single-cell drifting plants found on all ocean surfaces, including the tropical ocean. Phytoplankton are the most abundant plant species in the ocean and need ample sunlight and nutrients from the ocean water to thrive. Phytoplankton are found only in top layer of the water and are primarily dependent on the nutrients floating up from the depths of the ocean for sustenance. These plants are responsible for nearly half of the photosynthesis that occurs on earth. Phytoplankton converts nutrients and light into organic material, which is then utilized by the food chain in the ocean. When phytoplankton die, they drift to the ocean floors and become long-term storage units for carbon. What Process Is Responsible for Producing Most of Earth's Oxygen? Sarfaraz, Irum. "What are the Plants of Tropical Oceans?" Sciencing, https://sciencing.com/plants-tropical-oceans-6585062.html. 25 April 2017.